It is a physical and mental impossibility to picture Dr. Evil without his right pinky touching his lips in diabolical fashion. Now, thanks to Dwyane Wade, it is also impossible to think of David Stern without his accusatory pointer finger. 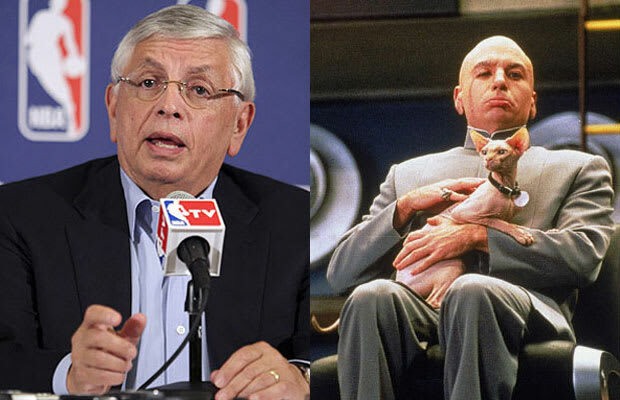 And while David Stern holds the NBA hostage, it remains unclear if he will subsequently attempt to place a stranglehold on the rest of the world with a "Death Star" or "frickin' sharks with frickin' laser beams attached to their frickin' heads" as is Dr. Evil's specialty. On a creepy note, if Dr. Evil is David Stern does that mean Frau Farbissina is Adam Silver? Eww.